Bruce Van Orden is a retired professor of Church History and Doctrine in Religious Education at Brigham Young University. In addition to volunteer work with needy individuals, he is writing a biography of William W. Phelps. William W. Phelps is most well-known in Mormon history for his uplifting hymns. Less appreciated is his calling soon after he joined The Church of Jesus Christ of Latter-day Saints to be “a printer unto the Church.” It was prophesied that “the world [would] receive his writings” and that he, Phelps, would “obtain whatsoever he can obtain in righteousness, for the good of the saints” (D&C 57:11-12). W. W. Phelps fulfilled this revealed duty as he published the Church’s first periodical, The Evening and the Morning Star; helped publish early editions of the Doctrine and Covenants; served as Joseph Smith’s scribe for the Book of Abraham and many other documents; helped publish the first hymnbook (for which he wrote about half the hymns contained in it); and helped compile the Church’s official history. Next to Joseph Smith, during the Prophet’s lifetime W. W. Phelps did more than any other leader to put forward the doctrines of the Kingdom of God. Any Latter-day Saint who has had the privilege to attend a temple dedication has sung or heard these words: We’ll sing and we’ll shout with the armies of heaven,/Hosanna, hosanna to God and the Lamb! (Hymns, 2). W. W. Phelps composed the anthem “The Spirit of God Like a Fire is Burning” for the first temple dedication in Kirtland in 1836. Often in general conference the Saints have sung or heard: Now let us rejoice in the day of salvation.No longer as strangers on earth need we roam./ Good tidings are sounding to us and each nation,/ And shortly the hour of redemption will come (Hymns, 3). This was the first of the “hymns of the restoration” written by a Latter-day Saint in this dispensation, by Phelps in 1832 in The Evening and the Morning Star in Independence, Missouri. Phelps has more compositions (fifteen) in the Church’s current hymnbook, published in 1985, than any other author. William Wines Phelps was born 17 February 1792 in Dover, Morris County, New Jersey. At age eight, he moved with his family to Homer, Cortland County, New York. He was well-educated for his era, although not in a formal university. He had training that he exhibited throughout his life in meteorology, surveying, classical languages, composition, poetry, handwriting, printing, and editing. He entered the newspaper business as a young man in Cortland, New York. W. W. Phelps was one of the most publicly known early converts. He had helped create a new social, religious, and political organization in 1827 in New York State known as Anti-Masonry. He edited two Anti-Masonic newspapers, in Trumansburgh and in Canandaigua, New York, the latter merely eleven miles from Joseph Smith’s home in Manchester. Through his newspaper connections, he obtained copies of the Book of Mormon two weeks after publication and sold them in his office. He and his wife Sally read this sacred book overnight and became converted to its truthfulness. After struggling with his conscience for over a year, Phelps took his family to Kirtland in June 1831. He was directed by revelation to accompany Joseph Smith and others to Missouri to identify the Land of Zion (D&C 55). He participated in all the dedicatory events for Zion and the New Jerusalem. He was directed to obtain a printing press and set up a business to print Joseph Smith’s revelations (Book of Commandments) and the Church’s first newspaper in Missouri. Together with Oliver Cowdery and John Whitmer he printed the Book of Commandments and edited The Evening and the Morning Star, wherein he wrote scores of articles promoting new revelations, the Book of Mormon, and preparing the earth for the Second Coming. He authored many hymns in this and future publications . His printing office in Independence was raided and the type destroyed in anti-Mormon mob action in July 1833. He and his family were among those Saints persecuted and then hounded out of Jackson County later in the year. He frequently represented the Church in petitioning the state of Missouri and the United States government for redress of the Saints’ grievances. 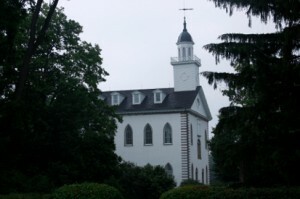 While in Kirtland, Phelps help print and write in the Church’s publications including The Latter Day Saints Messenger and Advocate, the first edition of the Doctrine and Covenants, and the first hymnbook. He was one of Joseph Smith’s chief scribes. Along with the other “presidents,” he helped govern the Church and set up the dedication of the Kirtland Temple in 1836. All four songs rendered in the dedication were of his composition. He helped lay out and found the city of Far West, Caldwell County, Missouri in 1837. During a contentious period among various Church leadership organizations in Missouri in 1838, Phelps was labeled a “dissident,” removed from leadership, and ultimately excommunicated. He testified against the illegal “Danite” activities in Missouri at a preliminary hearing in Richmond, Missouri, in 1839, that resulted in Joseph Smith and others being jailed and bound over for trial. Phelps asked for forgiveness from the Prophet in 1840 and labeled himself a “prodigal.” Joseph graciously invited Phelps back to the fold of Christ. In Nauvoo, Phelps helped write the official history, served in municipal government and publishing activities, and as Joseph Smith’s political scribe. He spoke at the funeral for Joseph and Hyrum Smith and then effectively supported the Twelve to succeed as leadership over the Saints. Phelps purchased another printing press in Boston that would be used in Utah. He served the Saints in their new mountain home as explorer, educator, surveyor, weather man, almanac editor, justice of the peace, speaker of the territorial legislature, and a “senior statesman” and writer. He passed away 7 March 1872. William W. Phelps is held in honorable remembrance by his posterity and all Latter-day Saints who are heirs of his hymns and other vital contributions. Just a couple of questions on Bro Phelps. In my readings he was excommunicated three times. Were any of those times the cause of Joseph Smith being in the Liberty jail? What did he say or do to get him excommunitcate and Joseph sent to Liberty jail.? And did he write Praise to the Man after Joseph was killed at the request of Emma? One of my ancestors was Ira Doty Wines. He was born in Vermont on July 1, 1814. His parents were Leonard Wines and Rhoda Baldwin/Wines. Ira Doty Wines moved to Indiana, Greene County sometime before 1834 and married Jane Maria Shearer on May 20, 1834. Ira and Jane Maria had three sons, and Ira Wines died on December 28, 1844. Soon after her husband’s death, Jane Maria with her three sons moved to Council Bluffs (Kanesville), Iowa to join the Mormon Church migration to Utah. In 1850, Jane Maria and her sons were part of a wagon train traveling to Utah, under the leadership of William Snow, and soon after her arrival in Salt Lake, she married William Snow. Could Ira Doty Wines of Indiana been related to William Wines Phelps? That might have been the motivation for Jane Maria Shearer Wines to take her three young sons on the long journey west.